Begin your tour at spectacular Table Mountain in Cape Town and travel all the way up to the barren salty flats of the Etosha Pans in Namibia. On the way we will stop to watch the sunrise from the top of Dune 45 in Sossusvlei, paddle down the Orange River in Namibia and visit the bustling town of Swakopmund. 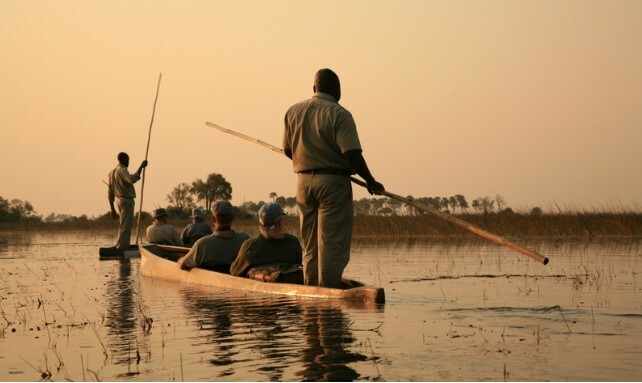 From Etosha we travel to Botswana where you can take a Mokoro ride through the Okavango Delta and then watch the sunset on a boat cruise on the Chobe River before finishing your tour in Victoria Falls, the ultimate way to experience Africa! Pick up Point: Please ensure you arrive at the departure point at least 20 minutes before the scheduled departure time. 8.00 am from Nomad Adventure Tours, 39 Castle Street, (Corner Castle & Burg Streets), Cape Town, South Africa. Border Post – South Africa: Vioolsdrift, Open 24 hours. Namibia: Noordoewer, Open 24 hours. We visit a Himba community close to Kamanjab where you will have an opportunity to interact with the people who live there. This is a working village and is only a representation of a larger group of nomadic pastoralists. The semi-nomadic Himba people are extremely susceptible to Western influence and have lost a large portion of their land to farmers, engineers, miners and many were displaces during the wars that raged in Angola. 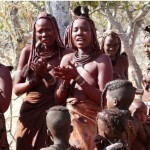 The dwindling number of pastoralists that still exist in their natural environment are protected as far as possible by creating a “buffer zone”, or an “educational tribe” where tourists who would like to get a better understanding of the way of the Himba, their lifestyle and their traditions, can do so without interfering with those still living in their natural environment. Visiting the Himba tribe can be a controversial topic that gets discussed at the camp fire, however not so much if the reason for visiting this particular tribe is understood beforehand. 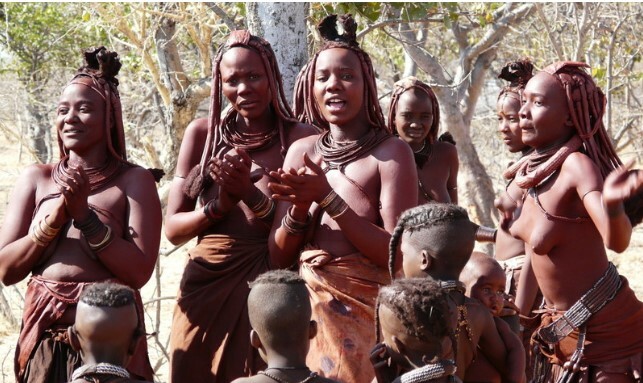 The income that this specific tribe generates from the visits goes towards the education of orphaned Himba children and assists the tribe in giving them a chance to learn about their own culture and heritage. Our journey takes us from Ghanzi towards Maun. Maun is the gateway to the Okavango Delta and this afternoon we will prepare for this excursion, packing small overnight bags. There may be an opportunity this afternoon to take a scenic flight over the Okavango Delta. After breakfast we board a 4×4 truck for our trip into the Okavango Delta, where we meet with our local guides and polers for our mokoro (traditional canoe) trip to our remote bush camp. 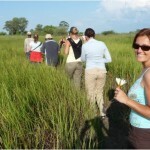 In the afternoon there is a nature walk with a local guide which gives a great chance to view wildlife on foot. Tonight we spend time swapping stories around the camp fire and enjoying the serenity of the Delta. Please note: If you have not purchased the Activity Package you will stay at the campsite in Maun for the following night. After an early breakfast, we will pack up camp and set out by Mokoro, travelling through the crystal clear waters of the Okavango Delta. Remember to keep an eye out for the wildlife that comes to waters edge for an early morning drink. After our mokoro ride, we will once again board our 4×4 safari vehicle and drive through traditional villages before entering the South Gate into what is undoubtedly one of the top wildlife destinations in Africa, Moremi Game Reserve. Upon arrival at Moremi Game Reserve we will spend the next hours enjoy a game drive throughout this incredible area. We leave the Delta behind us and travel east towards the town of Nata, near the Makgadikgadi Pans. This afternoon you will have the opportunity to participate in a 3-hour Game Drive to the Makgadikgadi Salt Pans. You will board the open roof 4×4 vehicles and travel through the Nata Bird Sanctuary, which sits within the awe-aspiring vastness of the Makgadikgadi Salt Pans. The pans are home to 165 different species of birds, including pelicans, spoonbills, eagles, ostriches and flamingos, that make the Sanctuary their home at different times of the year according to their migratory behaviour. Accommodation – Own Arrangements / Post tour accommodation can be booked through Nomad. A Yellow Fever Certificate might be required for this tour depending on your nationality. All clients require adequate Medical Insurance. Activity providers can refuse participation of activities, if the correct valid Medical Insurance is not provided. As visa requirements vary considerably from country to country and nationality to nationality, please contact the various embassies or a visa service agent in your home country to re-check your visa requirements at least 4 weeks prior to travelling. Please note that visas are the responsibility of the traveller and that Nomad Adventure Tours will not be held responsible for guests being denied entry should they not be in the possession of the relevant visas. As your tour may pass through multiple countries, we have prepared information on the use of local and foreign currencies, ATMs and Credit Cards for each country. Please be sure to arrive 1 day before your tour is due to depart. This will avoid any unforeseen problems. As the activities on your tour can be moved to any day during your tour, we also highly recommend that you book your flights to depart the day after the tour officially ends. Southern Africa: In general tipping in restaurants is expected and is around 10% for good service, more if you have received exceptional service, and, feel free not to tip at all if you received poor service. Tipping taxi drivers etc is really at your own discretion and not always expected. If in doubt please ask your guides. It is expected to tip porters and car-guards etc. Ask you r guides how much is appropriate in local currency. Our guides do work hard but they are also paid at (and often above) industry levels for this work. Our Crew can be tipped if you feel that they have done a good job and/or gone above and beyond the call of duty. The best way to arrange tips is to elect one person in the group to collect the money. We recommend USD1-2 (or about R10-R20) per day per person, per guide as a fair tip. So if you have 3-crew on a tour, we would recommend that 3 envelopes are used and each crew member’s name written on one. Place what you feel is fair into each envelope and the elected person can give these to the crew at the end of the tour. If you do not feel that the crew deserve a tip, please, do not tip them. You must remember that tipping is only for exceptional service and is not at all compulsory or expected. South Africa is one of the most popular tourist destinations in Africa, as it offers truly magnificent views and has an abundance of activities to enjoy. This Southern African country is rich with culture and traditions; with every citizen having a unique heritage, culture and story to tell. Here, guests will find themselves enchanted with a unique vibrancy and absorbed in the freedom of every citizen. The combination of the beauty of the landscape and friendly nature of the locals makes South Africa a truly inspiring and exciting country to explore. Since the 17th century and the arrival of its very first settlers, South Africa has been claimed, to be one of the most beautiful destinations in the world. Not only is the weather warm and mild throughout the year, but locals and visitors enjoying an endlessly beautiful scenery and diversity in landscapes. Undoubtedly, South Africa’s main attractions are it’s beautiful mountain and coastal views, however it’s cities also attract more than enough tourist attention. In 2010, South Africa hosted the FIFA Soccer World Cup, putting on an incredible show and proving themselves as one of the world’s leaders in the hospitality industry. Guests were made to feel welcome and encouraged to participate in local celebrations and enjoy the sights of each region; a factor which surely contributed to the Mother City of South Africa, Cape Town, being voted by TripAdviser to be the most desired tourist destination in the world. Among South Africa’s other top attractions is Johannesburg (The City of Gold), Durban (a surfer’s paradise), Port Elizabeth (the friendly city), the Garden Route and the Kruger National Park. A trip through this stunning country with show you just how far it’s come since the days of Apartheid and will showcase the diversity, vibrancy and freedom which makes South Africa a pleasure to visit today. The Orange River is the longest in South Africa, starting in the Drakensberg in Lesotho, it flows westward towards the Atlantic ocean where it spills out on the border of South Africa and Namibia. Although it passes through no major cities it plays a major role in the South African economy by providing irrigation to the vital farmlands. We offer many Nomad tours that include the Orange River, an overnight on the banks with a fire and good friends will create memories that will last you a lifetime. The Orange River tours are famous for canoeing that occurs on the world famous rapids of the region. Our tours don’t include full white water rafting adventures however on some of the Nomad Tours Orange River adventures you will have opportunity to enjoy canoeing on the river during the time that you overnight on the river banks. The Orange River forms part of the North West border of South Africa and therefore all of our tours that go to Namibia will cross the Orange River, and most of them we’ll overnight at a camp on the banks of the Orange River. The Orange River is famous for its historic diamond mining, but for some, the magnificent beauty that is found on the banks of the river. There are over 142 different species of birds that can be seen. When our adventure tours cross the Orange River we over night at a beautiful camp site with all the facilities you need to ensure a comfortable and enjoyable stay. Our Orange River travel gives you the amazing experience of a gentle paddle down the river in canoes that are provided by the camp site. Or you can spend the afternoon soaking up the sun on the river bank. However you choose to spend your Orange River stay during the Nomad tour you will be guaranteed to enjoy it. Namibia is Southern Africa’s most westerly nation and is home to some of the most beautiful desert plains and sand dunes. This nation has a truly unique landscape; completely unlike Angola, South Africa and Botswana which are its neighbours. Namibia is also one of the largest countries in African, covering 824000 square kilometres. While it covers a seemingly endless amount of space, at every turn you’ll find yourself facing a truly magnificent sight and rugged beauty. Although Namibia’s desserts may look lifeless, they’re in fact buzzing with life and activity. 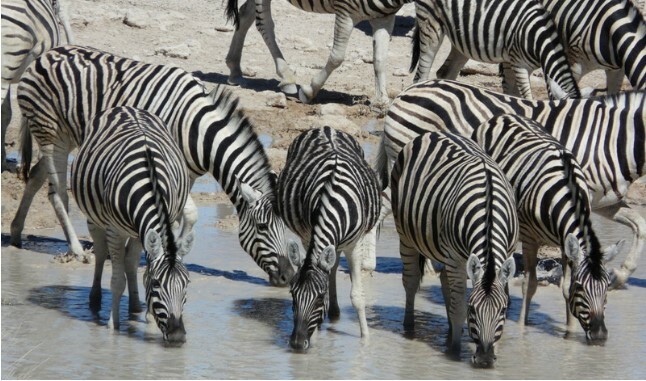 Home to the African wildlife that tourists travel miles to observe, as well as their very own wild horses and snakes, Namibia has several game reserves for their visitors to visit. The most popular and established being the Etosha National Park where guests can either choose to camp or stay in luxurious accommodation. If you’re planning an adventure into this beautiful and inspiring country, make sure you land up in Swakopmund, visit the Fish River Canyon, Damaraland and the Kaokoveld. A trip to the Skeleton Coast will show you the beauty of a desert meeting a coast. The Kalahari however, is one of the most astounding aspects of this nation, as it’s endlessly beautiful terrain and wildlife will take you to a mysterious and enchanting new world. The capital city of Namibia is Windhoek, a city which is heavily influenced by Namibia’s previous colonial ruler, Germany. Today, however the country has close ties to South Africa; its currency linked to that of the rainbow nation. 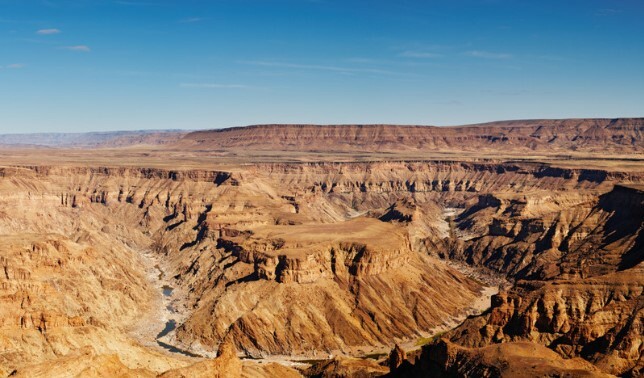 The Fish River Canyon in the South of Namibia is the second largest in the world and the largest in Africa, in places it is 27kms wide and up to 550m deep in total it is over 160km long. 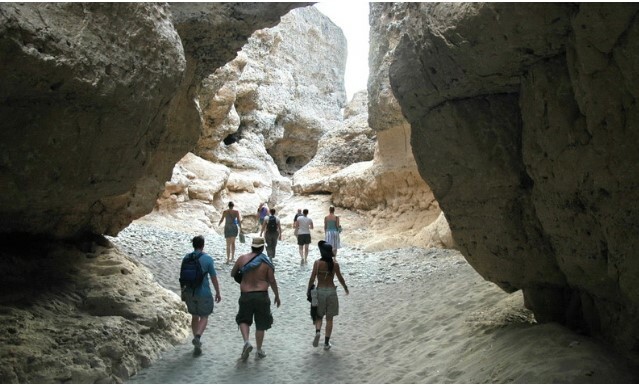 Fish River canyon tours should be on everyone’s list of things to see before they die. It is a natural wonder that should not be missed when visiting Southern Africa. Another major attraction of the area found at the Southern end of the Fish River Canyon Ai-Ais hot springs resort. 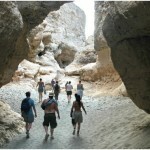 Four of our adventure tours include the Fish River Canyon as an attraction. Namibia is country full of amazing attraction and it can often be difficult to choose which ones you should visit, however with our experienced tour guides and our Fish River Canyon travel options you will be guaranteed to see the most memorable sites on offer. Our Fish River Canyon tours vary between the four depending on what else you would like to see and how much time you have to spend exploring the beautiful Southern Africa. 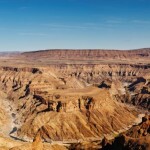 The Fish River Canyon is not only naturally beautiful it is historically significant as it provides clues into the ancient geology of the landscape. Our knowledge and experience when it comes to Fish River Canyon tours and adventure travel in Namibia is unparalleled within the industry and will ensure that you time is not only memorable but well informed. The Namib-Naukluft National Park is bigger than Switzerland at 49,768 square km, making it the largest game park in Africa. Being in Namibia this national park is predominantly made up of fiery desert and burnt orange dunes and hills formed by the push and pull of the wind. Unlike most wild parks around the world that are filled with typical wild African and untamed animals, the Namib-Naukluft National Park is filled with animals of a different kind. Snakes, never before seen “weird” insects as well as over 200 species of birds inhabit the area. 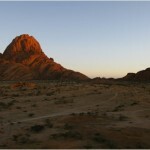 The Namib is characterised by its Inselbergs and rocky outcrops called Kopjes. These enclaves and outcrops have been completely created by nature and are the tell-tale signs of heavy wind and its ability to form natural art. They’re also evidence of Gondwanaland and the time when the two most southern tips of the world separated to form Africa, South America and Australia. Swakopmund is a coastal city on the North Western coast of Namibia, it is known as the adventure capital of Namibia and this is evident in the long list of optional activities that are available on our stop overs on our Swakopmund tours. The town has a permanent inhabitation of 42 000 residents so is by no means massive. It does however have a rich and fascinating history and the influence from the days of German colonization. The architecture is stunning and there are many quaint shops and nooks, you can lose yourself for an entire day in the city centre should you choose not to take part in the optional extras and would rather spend a day exploring. Join one of the World Renowned Nomad tours and experience a Swakopmund tour that will open your eyes to a corner of Southern Africa with a real story to tell. 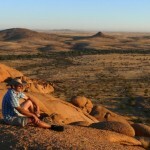 Spitzkoppe tours take you to a collection of granite peaks located between Swakopmund and Usakos. The peaks stand out dramatically on the flat desolate landscape. The granite that forms the peaks is over 700 million years old and the highest of them rises 1784 meters above sea level which works out to 700 meters above the desert. One of the major attractions of the region are the rock paintings done by the Khoi San tribes that inhabited the area. The Spitzkoppe tours run by Nomad Tours take advantage of not only the natural wonder of the area but the historic significance of these paintings. 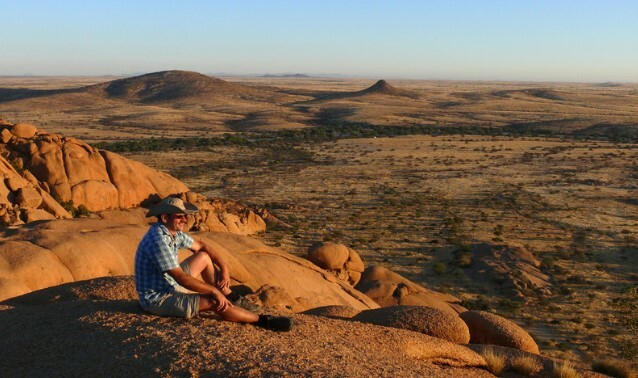 Our Spitzkoppe travel package is available on three of our tour packages. All of them involve setting up an over-night camp at the base of one of the granite peaks and a guided tour of the natural wonders of the area. The peak is known by rock climbers all over the world as one of the most challenging in Southern Africa. 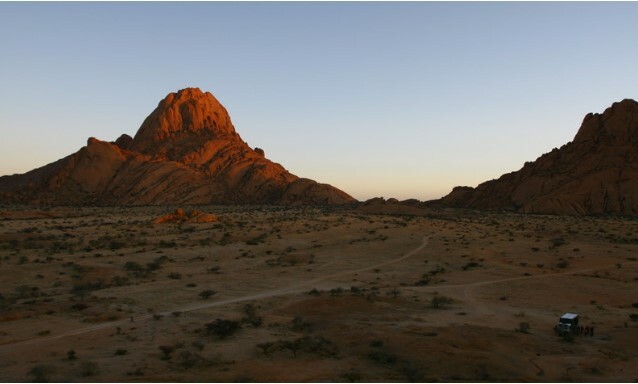 Although our Spitzkoppe tours don’t offer the chance to climb the peak, there is a guided nature walk of the area and you will have free time to explore the region around the camp and if you are feeling adventurous you can try climbing it for some stunning views. On the Nomad Etosha National Park tour we will take you on several game drives that utilise an elevated truck to provide the best possible game viewing. There are optional night drives for you to take part in, and although they are not included in the Etosha National Park tours they are highly recommended. 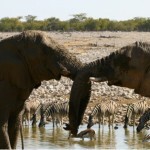 The optional game drives are taken with expert guides who have an abundance of local knowledge. The Etosha Pan is a truly beautiful and unique place with game viewing that you will not see anywhere else in the world, the facilities are world class to make for a comfortable and memorable stay. The natural beauty and abundant wildlife will provide countless photo opportunities to make your friends jealous. Game viewing can never be offered with guarantees, as you are dealing with wild animals you can never be certain of how they will behave. 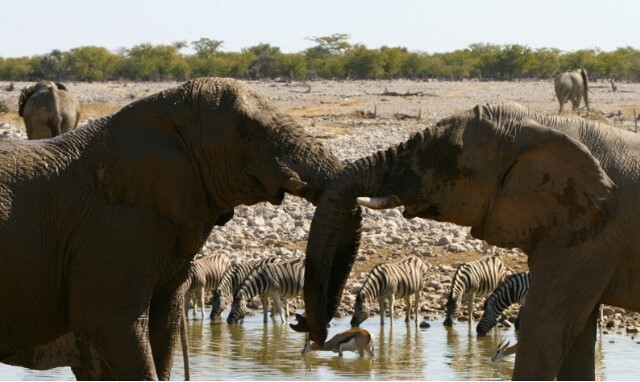 We can guarantee that on our Etosha Pan national park tours you will meet people and have experiences with them that will form the basis of lifelong friendships. Namibia is one of Africa’s most beautiful regions – the desert landscape is a photographer’s dream; known for its sweeping, red-gold dunes, sparse vegetation and abundant wildlife. Windhoek is one of the country’s busiest cities – known for its alluring diversity and cosmopolitan feel, the metropolis attracts myriad visitors each year. 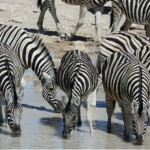 Tours to Namibia are a wonderful way to immerse yourself in the area’s vibrant culture and heritage. Wander through the town and gaze at an array of stately buildings, including the impressive parliament buildings and Hero’s Acre. If you’re historically inclined, then ensure that you pop into the plethora of museums on offer, including the National Library and National Art Gallery. If you’re in need of some rest and rejuvenation, then visit the serene National Botanical Gardens to immerse yourself in the tranquillity of the gorgeous grounds. Botanists will delight in the numerous plant species on offer which attract plenty of exquisite insects and prolific bird life. Windhoek is a captivating blend of African and European influences – the country gained independence in 1990 and exudes its own unique character and charm. With a reputation for being extremely safe and well-cared for, this is a place where you can wander around without feeling insecure and anxious. Make sure that your itinerary includes a trip to the smallest functioning cathedral in Southern Africa – St Georges, and look out for Das Reiterdankmal – a towering bronze sculpture of a horse commemorating those lost in colonial wars. Stroll down Robert Mugabe Avenue to admire Alte Feste – one of the city’s oldest buildings that was built in 1890. Once military headquarters, today, it serves as an intriguing state museum, housing an array of memorabilia that commemorates Namibia’s journey to independence. If you have little ones, then make sure that you visit the delightful Zoo Park which is an ideal hot spot for picnics. With a pond and a playground on offer, the beautiful park is sure to be a hit with your kids. Windhoek is an ideal place for families – with a reputation for being a close-knit, friendly community, the city has a host of amenities on offer for young and old alike. If you’re embarking on Windhoek tours, then make sure you see as many of the impressive, historically significant sites as possible. The Bushmen of Southern Africa are the oldest indigenous inhabitants of Southern Africa and have lived off the land in symbiosis for hundreds of years. They have much to offer our modern way of living in terms of a sustainable existence with nature. Bushmen tours give you the opportunity to interact with this fascinating culture and get a true understanding of how they have survived in the harsh environment through an understanding of nature. The San people have inhabited large parts of Southern Africa including the regions and deserts of southern Namibia. They are known colloquially as bushmen, this however is a broad term used to describe indigenous people of Southern Africa, the people native to the area that our bushmen tours stop in have, however, developed a way of life that is as unique. Our tours into Namibia are renowned as some of the most rewarding you can do, yet they can be so much more rewarding by taking part in one of the bushmen adventures with Nomad tours. Learning about local culture is an important aspect of travelling to any country. Many of Namibian overland tours offer the opportunity to interact with a traditional village of San people that still live very much the way that they did many generations ago. It is not included in the tours and needs to be decided on before-hand. Some people feel it is unethical to treat the villagers as a spectacle however it provides an education for the visitors and much needed funding for the conservation of the area and their way of life. Botswana is a southern African landlocked nation, surrounded by Zimbabwe, Zambia, South Africa, Namibia and is one of Africa’s most popular inland tourist destinations. Despite being quite a large country, Botswana remains to be one of the world’s smallest communities with just over two million people calling themselves citizens. Most of the locals can be found working in the nation’s capital city, Gaborone, however many others work on game reserves and with the country’s tourism industry. Over seventy percent of Botswana is covered by the Kalahari Desert; the largest desert in southern Africa and one of Botswana’s largest claims to fame. Here, guests are enchanted of the beauties within the desert and will find a new appreciation towards the tribes that called this rugged terrain home. 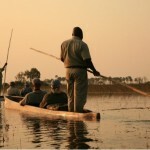 Botswana’s Okavango Delta is the world’s largest inland delta and is alive with vibrant bird species and wildlife. In comparison to the vast Kalahari Dessert, the delta is lush and green; a true magical world where life is simple and relaxation is unavoidable. A trip to Botswana isn’t complete without a visit to the Makgadikgadi Pan, an incredibly large salt pan where you’ll delight in peace and quiet. There is hardly any live here, as the salt pan makes it hard for nature flourish, however exploring the pan will show you another wonder unlike any other, a true escape from civilization and a surreal, beautiful place. Botswana is truly a unique country with a landscape and beauty unlike any other; from deserts to delta, bushveld to grasslands, savannas to salt pans, Botswana is a true joy to explore and offers a world of adventure to all tourists. 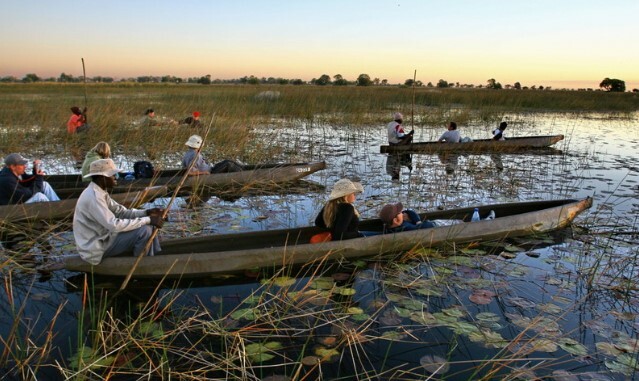 Maun, the fifth largest town in Botswana, is known as the tourism capital and the gateway to the Okavango Delta. It is an eclectic contrast of modern buildings and traditional huts. Now home to over 30 000people, the town was founded in 1915 as the tribal capital of the Batawana people. It originally serviced the local cattle ranching and hunting operations of the area, and had a reputation as a hard-living ‘Wild West’ town. With the growth of the tourism industry and the completion of the tar road from Nata in the early 1990s, Maun developed swiftly, losing much of its old town character. However, it is still infamous for its infestation of donkeys and to lesser extent, goats. These animals can be seen wandering around freely as the local farmers arrive in the innumerable taxis to sell their wares on the kerbside. 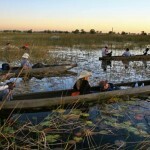 The Okavango Delta is Botswana’s most popular tourist destination. Every year, more than 11 cubic kilometers of water flow from the Okavango River into the Delta, irrigating more than 15 000 square kilometres of the Kalahari Desert, making it the largest inland delta in the world. Here, you’ll find yourself exploring a lush paradise home to Africa’s most beautiful wildlife and bird species while submersing yourself in pure tranquillity and an African landscape unlike any other. 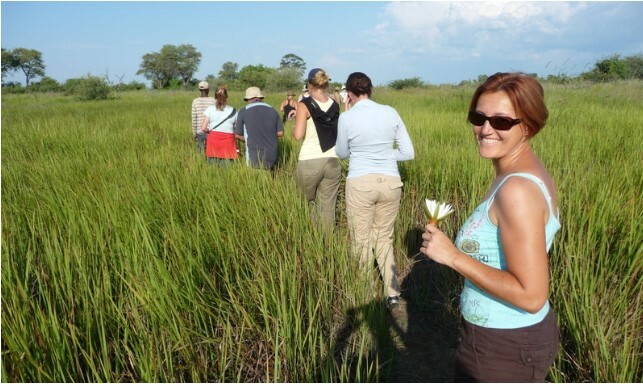 Exploring the Okavango Delta is a must for any tourist visiting Botswana. Here, you’ll have an endless list of activities to participate in, truly making the most of your time in this paradise. 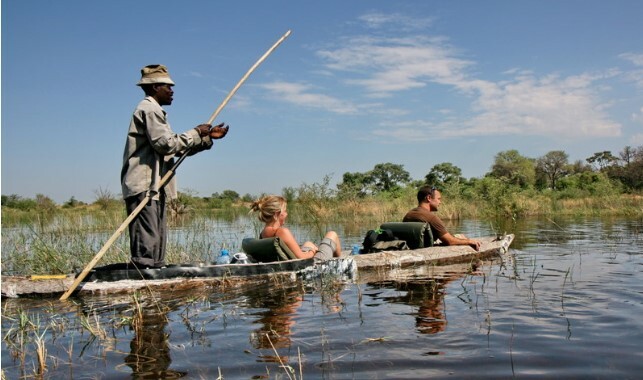 Boat trips, canoeing and fly-overs are among the most popular, however you can also go fishing and walking safaris depending on the time of year. As the Okavango is a seasonal delta, you’ll find yourself facing a different environment during the summer and winter months. The rain falls at the beginning of the year. 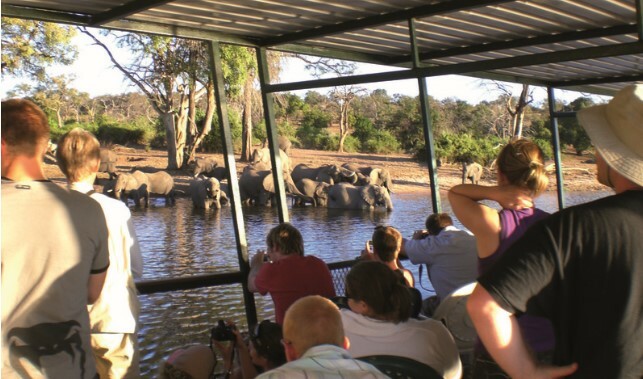 The Chobe National Park is situated in the north west of Botswana and is undoubtedly the country’s most beautiful and popular nature and game reserve. It has one of the largest cnocentrations of wildlife in Africa, making it an ideal location for African safaris and is the third largest park in Botswana, after the Central Kalahari game Reserve and the Kgalagadi Transfrontier Park. The Chobe National Park can be divided up into four sections, making it a true rarity and an explorers paradise. It can be divided up into the Serondela area, Savuti Marsh area, the Linyanti Marsh and the dry hinterland. Wherever you go in the park, you’ll be able to observe a variety of wild animals and bird life, and can even explore an area in search of a specific animals or bird. There is an incredibly large elephant population in the Chobe National Park; tours through the park will show you some of the park’s 120 000 elephants. Zimbabwe is an incredibly beautiful, land-locked nation in the centre of Southern Africa. Despite its political and economic struggles, it remains a country of breath-taking beauty and lush landscapes. Famously bordering on the magnificent Victoria Falls and stunning Zambezi River, this is a country of astounding beauty and is by no means short of attractions and activities. Zimbabwe, previously known as Rhodesia during its colonial days, has been the focus of many explorers during the last few centuries. It was Rhodes that orchestrated the building on the first railway line through the country which stretches across the entire African continent, and David Livingstone was the explorer to hear the thunderous sound and say the spray of the world’s largest natural waterfall, the Victoria Falls; named after his sovereign Queen Victoria. Zimbabwe’s Hwange National Park and Matopas rock formations are among the country’s most famous attractions. Just an hour outside of the town of Bulawayo, the Zimbabwe Ruins of the historical Great Zimbabwe can be found; the kingdom belonging to the first organised community of Zimbabwe during the pre colonial days. Zimbabwe received its independence in 1980 and has struggled to maintain a democratic state ever since. However, despite its unstable economy and the fragile political state, thousands of tourists make their way to the country every year, wishing to explore its African roots and be spellbound by its beauty. Zimbabwe has a unique landscape, atmosphere, community and culture which set it apart from its fellow Southern African nations. The beauty of this country will easily allow you to forget it’s complicated structure; indulge yourself in the magnificent Victoria Falls, astounding structures of Motopas, observe the African wildlife and take yourself back in time to the Great Zimbabwe Ruins. 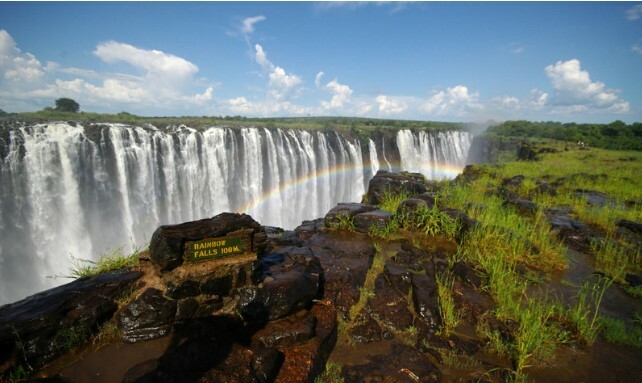 Victoria Falls is undoubtedly one of Africa’s most beautiful treasures. 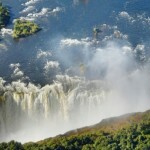 They border Zimbabwe and Zambia and are the region’s most visited tourist hotspot. 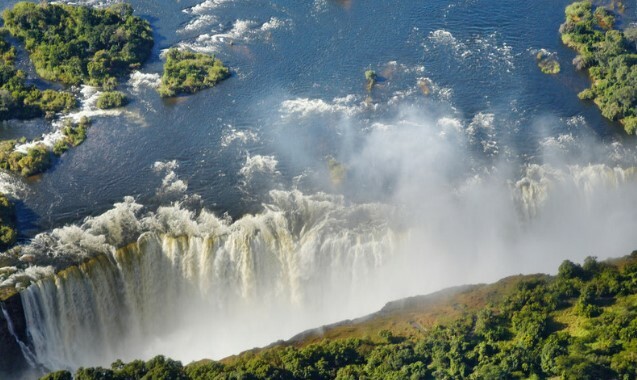 The falls are by no means the world’s biggest waterfall, however their length and the vast volume of water which find its way to the falls via the Zambezi river makes them the world’s largest waterfall. Victoria Falls was names after Queen Victoria by the first European explorer who set their sights on them, David Livingston, however up until then, and still today locally, the falls were known to be The Smoke That Thunders, “Mosi-oa-Tunya”. The entire volume of water of the Zambezi travels into Victoria Falls, flowing into its first gorge, creating a spectacle and a true sight to be seen. In fact, you don’t even have to be close by to the falls. Aptly getting its name as The Smoke That Thunders, the falls spray water into the air which can be seen for miles, including in the surrounding game reserves and national parks. Victoria Falls safaris are among the most popular activities to participate in when visiting the falls. Guests can embark on bush safaris – on foot, horseback or in a vehicle – and embark on a Zambezi cruise along the waters before the falls. 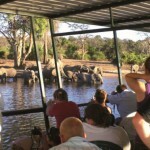 While on these Victoria Falls safaris guests will have the chance to see crocodiles, hippos and other African wildlife. 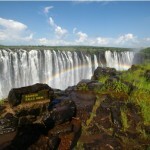 Travel to Victoria Falls with Nomad Tours for an unforgettable and inspiring vacation in Southern Africa. Not only will you be able to see one of the Seven Wonders of the World and a truly beautiful world heritage site, but you’ll be able to participate in exciting activities such as white water rafting, canoeing, bunji jumping, and an authentic Victoria Falls safari.